managers take care of your entire content project. Do you need to outsource entire content projects? Do you want high-quality content written to your exact specifications that you can publish immediately? Are you interested in additional content-related services, for example search engine optimization? Textbroker Managed Service helps you find and brief the right authors to deliver the highest-quality content. Outsource your entire project and get individualized support from our team of content experts. Whatever the type or amount of service you require, we provide customized service packages for projects with a budget of $2,500 or more. With Textbroker’s Managed Service, you can get unique content in 36 different languages, written and composed by native speakers. We also offer a translation service for every language in the world. Get high-quality content for any market – learn more here. We provide polished, professional content, and individual support for your project. Click here to learn more about the many advantages Textbroker Managed Service offers. You tell us the topic and your preferences – we deliver finished, high-quality content that is ready to publish. For projects with a budget of $2,500 or more, Textbroker Managed Service provides you with personalized service for high-quality, customized content. Click here to learn more about the terms of Textbroker Managed Service. 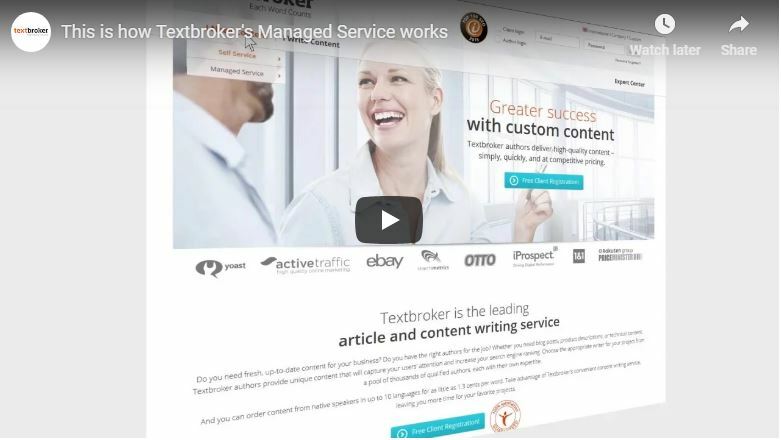 With Managed Service, Textbroker offers unique content in 36 languages as well as a worldwide translation service. Content marketing is the practice of creating high-value content for your target audience to attract and engage them. It should be a core component of your marketing strategy. When companies provide consistent, valuable information to their customers, they build brand loyalty and drive business. In our Expert Center, we offer a wealth of information on everything related to content marketing, search engine optimization, and best practices for unique, high-quality content. We support both authors and clients with blog articles, tutorials, videos, and much more.